Enjoying the opportunity to sample and enjoy Japanese food is one of the most popular attractions at the Festival! Our Culinary Arts Pavilion will return with new chefs and opportunities to learn how easy it can be to cook Japanese food at home. There will be Japanese cooking demonstrations and discussions all day and samples will be available for the demonstrated recipes! The Japanese Americans’ Care Fund provides assistance to those in need among the Japanese and Japanese American residents of the greater Washington DC area. There is a lot more tasty Japanese dishes besides Sushi and Ramen. Care Fund will be showing how to make easy Japanese dishes at your own home! We are very proud to have demonstrating at our Culinary Arts Pavilion our stage Yoshitaka Nishino, CEO of Matsukawaya Co. His company is world renowned for wagashi (Japanese sweets) that are "art for the five senses": beautiful shapes and colors, sweetly fragrant, creative names, and most important - they taste delicious! 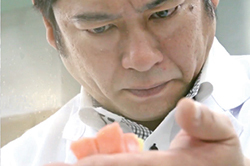 Come learn about the tradition of hand-made wagashi from a master!